My first book in print! 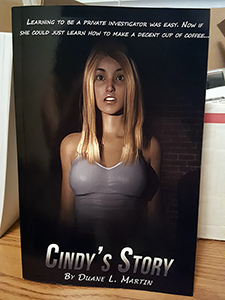 I got my first three copies of Cindy’s Story paperbacks yesterday. As you can see the text on the top needs to be resized slightly, which I’ve already done. I’m just waiting for CreateSpace to pull their finger out and approve the updated cover image. All in all, I’m really happy with it, and it’s a lot thicker than I thought it’d be. I only bought three to start with because I wanted to make sure they were ok before I bought more. I’ll buy a full batch once the new cover’s approved, and then I’m going to take them to a local book store to see if they’d be interested in carrying them. Anyway, just a little update on that. I’m into chapter four of the final book of the Unseen Things series. Yes, this will be the final book in the series, and I have a great ending planned for it. It’s sad to bring it to an end, but I just don’t feel like I have any more story to tell after this one, and I want to move on to other standalone projects. It was great writing a series, but I really want to focus on solo novels like Cindy’s Story from now on. That’s it for now. I’ll post more updates when I have something of interest.